Happy birthday, Powerslave! You still sound young! 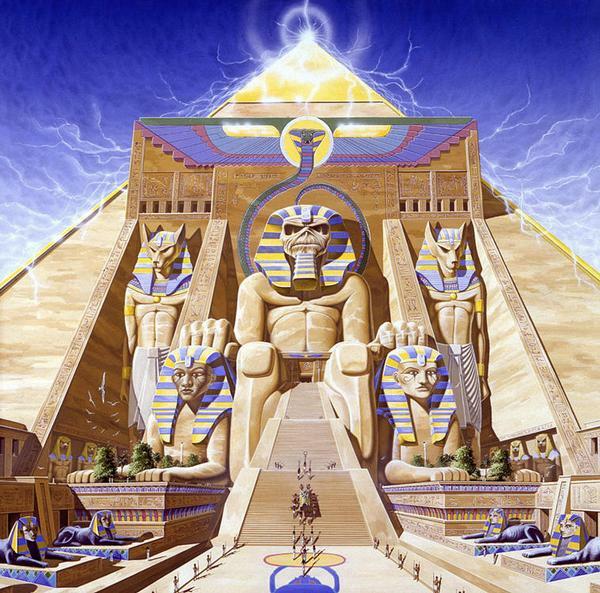 Iron Maiden’s fifth studio album was released on September 3, 1984, and was titled Powerslave after the epic song about pharaoic powerlust written by singer Bruce Dickinson. 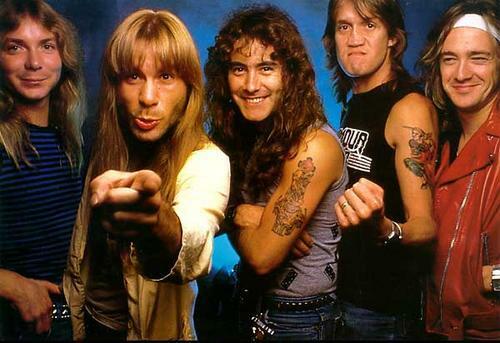 The album cemented Maiden’s position as an international headlining act and confirmed their claim to the heavy metal throne, coming hot on the heels of breakthrough albums The Number Of The Beast (1982) and Piece Of Mind (1983). That’s right, in just over four years the band had released five (!) impressive studio records that took them from their early days and into their classic era. It blows the mind! Powerslave was the second album to feature the classic era line-up of Dickinson, Steve Harris, Dave Murray, Adrian Smith and Nicko McBrain, which thus became the first Maiden line-up to make more than just one record together. It was produced by the great Martin Birch, who bears no small responsibility for creating Maiden’s classic era sound. The following world tour, the 1984-85 World Slavery Tour, would be the longest Maiden ever undertook when it comes to the sheer number of concerts, just barely edging the 1982 Beast On The Road tour. 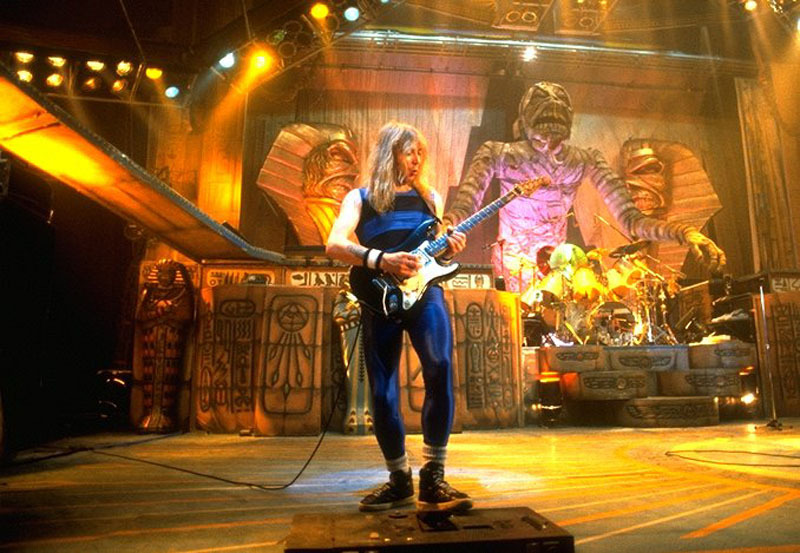 The set featured a strong selection of material from the first four albums, as well as what would soon become Powerslave classics: Aces High, 2 Minutes To Midnight, Rime Of The Ancient Mariner, and Powerslave itself. And the production? The Egyptian masterpiece that was Derek Riggs’ album artwork came to life in unexpectedly classy glory, to create one of the greatest stage productions in the band’s history, as argued in this article. Setting the bar for 1980s stage spectacle: The World Slavery Tour production in full flow. By 1985 Iron Maiden was the biggest metal band on the planet, plain and simple. Their most successful world tour was followed by their first live album, the classic double record Live After Death (1985), and they could finally take a few months off to enjoy the fruits of their labor. They would need it, for following up the Powerslave monster would be a challenge indeed. Click here for an in-depth look at Maiden’s classic era! This wil always a be an amazing album which, I think, cemented Maiden’s reputation both as a studio and live band. I think this is also my favourite Iron Maiden artwork. If you carefully study the album cover on the larger vinyl version, there’s a few little messages and drawings in the walls. I’m sure I spotted a Mickey Mouse head in there somewhere! Oh yes, I forgot about the droids!! To me, this album shows the pros and cons of a young band running on adrenaline and momentum with a crazy work schedule. Aces High, 2 Minutes, Powerslave and Rime are absolute classics. The rest of the songs, to me, are decent but don’t set the world on fire. And Losfer Words should have been Lostoff the album. I think the run of ’80s albums had sharper highs but more filler than the reunion releases, which have been more considered and better balanced. ‘Flash Of The Blade’! Much underrated & for me – much loved!!! Couldn’t agree more! It’s one of my favorites! Powerslave is one of my top 5 Maiden record of all time , sins i got this album i can after 30 years still be suprised of the songs on this album. For me its magic !! Thank you IRON MAIDEN for this AMAZING record that still make me feel good . The Rime could’ve been easily part of The Final Frontier, if you consider the length of it, structure of the song and lyrics. Back then it was quite an unusual track, I guess. It’s like a taste of what the band would continue on in the future. Except that it doesn’t start off quiet. I wish Maiden would go back to starting their songs with a bang and not a whisper, even the epics. I agree. That would probably cut the length of most of the songs too. What bothers me is that there are also long middle sections, like in Isle Of Avalon. Often it feels like an anti-climax, or just an unneeded prolongation of the song. Personally, I think this is the album that proved their extraordinary musicianship, as well as composing skills — The guitar arrangements in “Flash of the Blade,” alone, could have been taken straight out of Bach’s playbook. The transformation from “large” to “larger than life” was truly something to behold and it’s still magnificent to the ears. I believe, up until “Piece of Mind,” they had proved themselves contenders to be reckoned with. But “Powerslave” made them champions. There will never be another band like Maiden again.